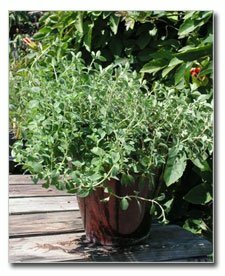 The oregano family has many members and is a wonderful groundcover as well as a culinary delight. Hilltop Oregano, named for Madalene Hill, is one of the most flavorful. Members of the mint family, the various oreganos hybridize quite freely, hence the multiplicity of names encountered by the oregano-fancier. But Hilltop is one of the best. Madalene Hill was given one of these oreganos many years ago by a visitor from California; she found that it to have a unique flavor that differentiates it from others of the same botanical name (origanum x majoricum) and has continued to spread starts of the plant since that early introduction. 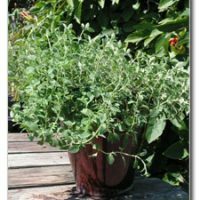 Hilltop Oregano is evergreen in our region, making it available to the cook throughout the year. Cultivation is very simple — well-draining soil, day-long sun, occasional applications of a balanced fertilizer, and frequent use keep it producing. It makes a lovely mound of green in the landscape.